Horizon Platforms provides safe and easy access platform hire, sales and training to customers across the north of England and beyond. 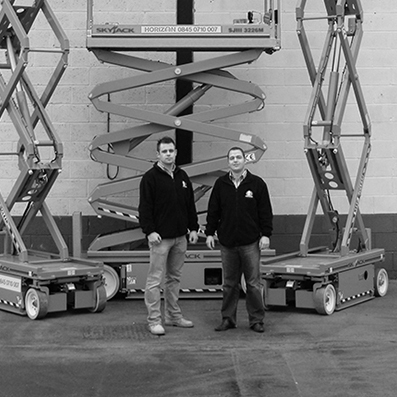 We offer a fleet of cherry pickers, scissor lifts, boom platforms and personnel lifts, an experienced team of driver demonstrators plus nationwide coverage through the Access Alliance - a nationwide network of trusted partners providing access platforms to customers throughout the UK. "Our dedication to providing the best interpersonal experience is backed up by employing a policy of buying - and therefore supplying - only the very best powered access equipment. To be known as the best, we must supply the best. We therefore only ever buy the best quality equipment from the finest manufacturers and then maintain it to the highest of standards. Corners are never cut at Horizon." "To help ensure that our own aims and desires stay deep rooted throughout the business, we have created a set of core values. These not only send out a message to all who may come into contact with Horizon - setting their expectations as to how they will be treated - but they also act as a benchmark to appraise ourselves. This is something we now do annually to guarantee our culture remains unchanged as we grow."